So there you are deciding to get back on the wagon, to introduce more fitness into your life. To be healthier, happier and more energetic. All you have to do is actually get back on that elliptical, treadmill, bike or weight machine...but then you forget or you get hungry or something comes up and that wagon get's further and further away. Here are some motivational tips to keep that from happening and to get your fitness on track. Keep your workout bag in a visible location to remind you of the task at hand. Bring it to your office/cubicle/locker or leave it on the front seat in the car. This makes it easy to get into your workout clothes and also is a good visual stimulus. 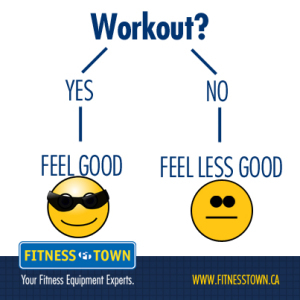 Change into your workout clothes. Even if you are just going to your home gym, it is easier to start your workout without getting distracted if you are already dressed the part. If you can change into them at work do it! Morning workouts. Things tend to come up in the evenings but by getting your workout done early you can spend the evening doing whatever you want. As someone once said "get your workout in before your brain realizes what you are doing." Set a goal and find a visual representation for this goal. Maybe you have a photo of yourself at a certain weight that you can put on the fridge or at your desk. Maybe there is a pair of pants you want to fit back into that you can leave on a chair at home. What you shouldn't do is have unrealistic goals - DO NOT post photos of models on your mirrors or have negative self talk....which brings us to #5. Have positive self talk. Talk yourself into a new fitness lifestyle. Remind yourself that you can do it, that every workout helps and be proud of yourself when you do what you set out to do. Post quotes or follow someone like us on facebook or twitter or follow our pinterest motivation board. Positive motivational quotes are another way to make you feel good about fitness and remind you to stay on track. Have fun. Don't start with a workout that is horrible and leaves you sore for days. You can work up to that but until you are back in the routine find fitness activities that you enjoy....yoga, dance, cardio, jump rope, boxing etc. Buy equipment for your home. Whether you have a big budget and/or space or a smaller one, you can get some equipment for home that can be used in front of the T.V. Ensure it is visible to remind you of your feat at hand. Even just a kettlebell or exercise ball can help you a lot. Write your goals down and track your progress. According to a study conducted by a psychology professor at the University of California, people who write down their goals are 42% more likely to keep them. Telling a friend increases this rate to 78%. Which brings us to 10. Stay accountable. There are a few ways to do this:Try an accountability partner. Have a friend or family member who also wants to eat better and workout? Great call or text them at the end of every day for a check in. Having to tell someone else of your progress will often help you from "cheating" on your regimen. etc. Then you can check off the things you have done and circle the ones you haven't. And with that, fly little bird, fly like the wind. You can do it!